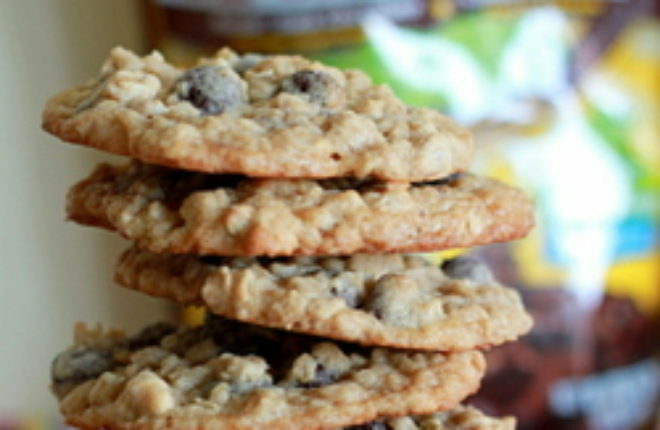 Chocolate chips + oatmeal cookies are good. Raisins + oatmeal cookies are good. So I thought, how about chocolate-covered raisins in oatmeal cookies? Also good, as it turns out. Really good. Especially when you use the dark chocolate Raisinets, but regular Raisinets do just fine. Raisins are one of those super-divisive foods that can bring out the passionate opinions in even the most placid of folks. See also: olives, cilantro, avocados, mushrooms. I actually like all of these foods. Especially raisins. Those silly raisin-haters don’t know what they’re missing. A bowl of oatmeal is incomplete without ’em, for instance. Okay, I’ll admit I don’t really like them (or much of anything) in my carrot cake, but I find plenty more places for them than not. And Raisinets – chocolate-covered raisins? Yes, please. I would like to find them just about anywhere. Like in these cookies, for instance. 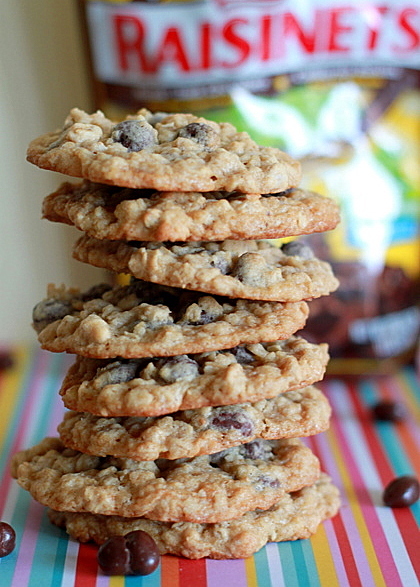 Chocolate chips + oatmeal cookies are good. 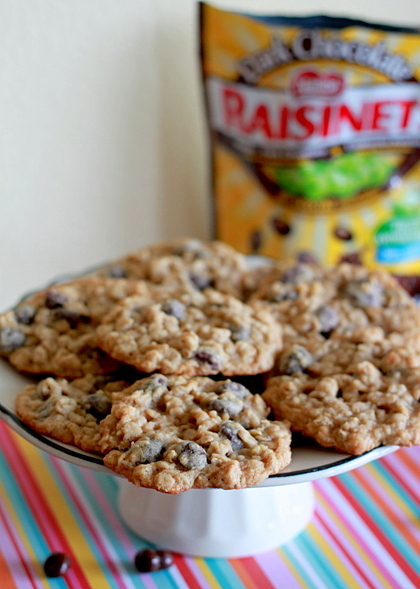 Raisins + oatmeal cookies are good. So I thought, how about chocolate-covered raisins in oatmeal cookies? Also good, as it turns out. Really good. 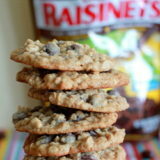 Especially when you use the dark chocolate Raisinets, but regular Raisinets do just fine too. They may even convert a few raisin-haters out there. You’d think that’s impossible, but I witnessed it in my own home when my guy requested another one of these. And another. Now to get him to come around to avocados. In the large bowl of a stand mixer afixed with the beater attachment or in a large bowl using a hand mixer, beat the butter, brown sugar and granulated sugar together until fluffy, about two to three minutes. Place a sifter over the bowl and sift in the flour, baking soda, and salt. Add the oats. Mix until blended. Place in rounded tablespoonfuls on an ungreased cookie sheet. Bake for about 8 minutes, until they look set and the edges begin to look golden. Remove from oven and let cool for about five minutes, then transfer to a wire rack to cool the rest of the way. Best idea.. ever! I get Raisinets every time I go to the movies, even when I was a kid they were one of my favorites 🙂 I never even thought to try and put them in a cookie, yum! Love your cookies, this is such a fun recipe! Great recipe…too bad you stole it straight off the bag. The next time you make something, give credit where credit is due. Sam, I always give credit when I start from another recipe. Always. The recipe clearly states “adapted from Nestle,” though in this case I started with their Chocolate Chip Oatmeal Cookie and tweaked from there. If this recipe is on bags of Raisinets, that’s news to me.